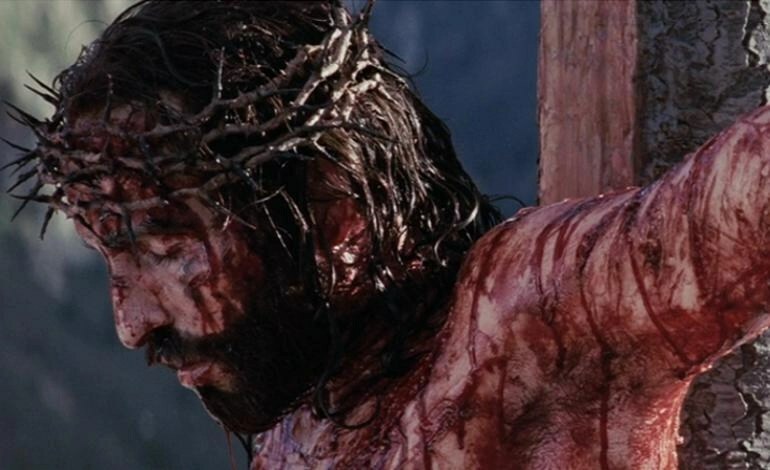 Mel Gibson has said that his movie The Passion of the Christ was meant to be a cinematic Stations of the Cross. These meditations, first written for Faith & Family magazine, are meant to glean the powerful lessons of the film. Prayer: Lord Jesus, the works of artists give us a window to help us see you. 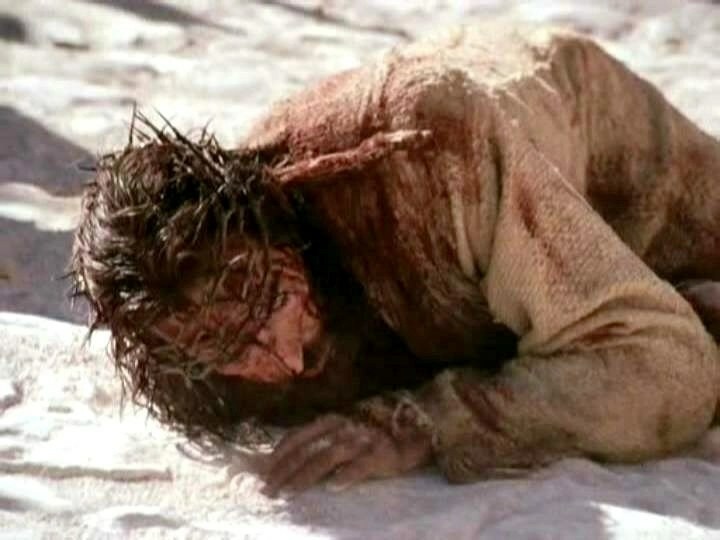 As we use the film The Passion of the Christ to follow your steps on the day you died for us, spiritually unite us with the reality of your suffering and death so that we can know you better, love you more, and imitate you in what we do and say. We adore you, O Christ, and we bless you … because by your holy cross you have redeemed the world! In the film, Pilate condemned Jesus because of vanity — he was worried what others would think. 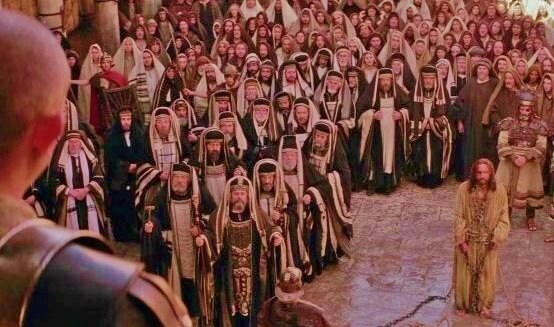 Caiaphas condemned Jesus because of pride — he wanted his way, no matter what. Herod condemned Jesus because of sensuality — he was indifferent to whatever failed to entertain or interest him. What about me? Which of these most often drives my sins? What can I do about it? Prayer: Lord Jesus, help us to imitate the loving way you accepted your Father’s will — even though it meant others would be set against you, humiliate you, and cause you great pain. Amen. 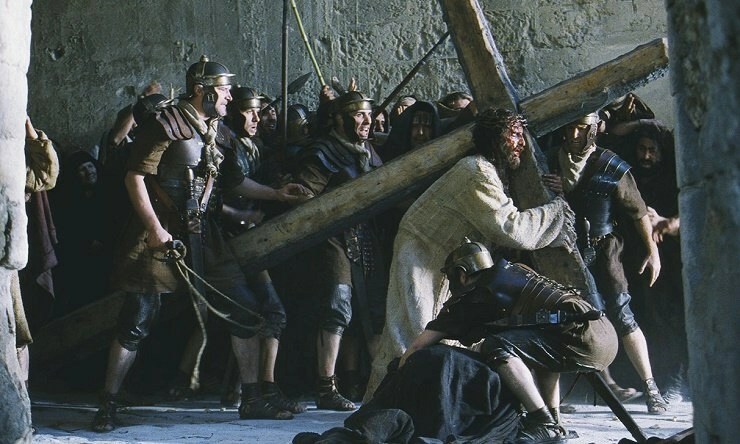 The film contrasts the two thieves crucified with Christ. The bad thief ridicules Christ for accepting his cross. We can presume the bad thief’s life up to that point consisted in getting what he wanted by doing whatever he could get away with. I, too, try to get by with the minimum as I seek to please myself. What crosses do I reject? Prayer: Lord Jesus, the good thief accepted his cross in the end, and it brought him to paradise. Help me to accept the crosses you send me for my sanctification. Amen. 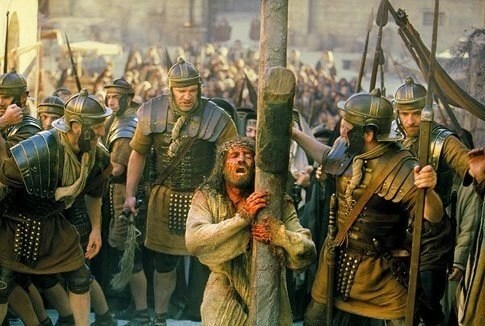 In the film, Jesus’ followers were distressed when they saw Christ condemned in the courtyard, then scourged, then burdened with the cross. But they still might have expected him to rise up and strike down the Romans at last. When he fell, it began to hit home. The soldiers were winning! Setbacks and failures in my life test my faith, too. How quick am I to doubt when the chips are down? Prayer: Lord Jesus, it is easy to speak with eloquence about the cross. But you know that the cross isn’t eloquent. It’s real — hard and heavy. Give me the grace to reject discouragement anyway, just like you did. Amen. The film shows Mary’s concern for Christ — both as a child and as an adult. 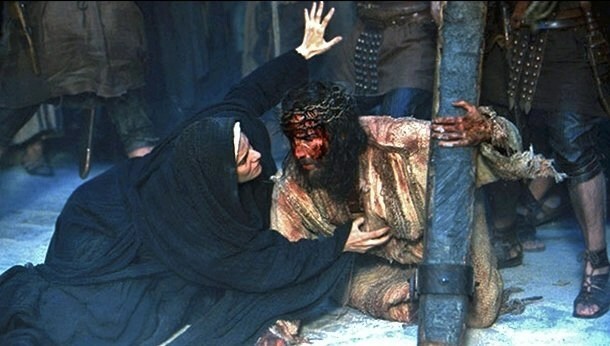 What great sorrow she feels at the suffering inflicted on her son! But it’s my sins that Christ is suffering for. It’s my guilt he carries. Do I count myself among those who caused Mary this great sorrow? Prayer: Lord Jesus, thank you for making your mother our mother, too — we take comfort in our trials when she tells us, “I’m here.” Amen. 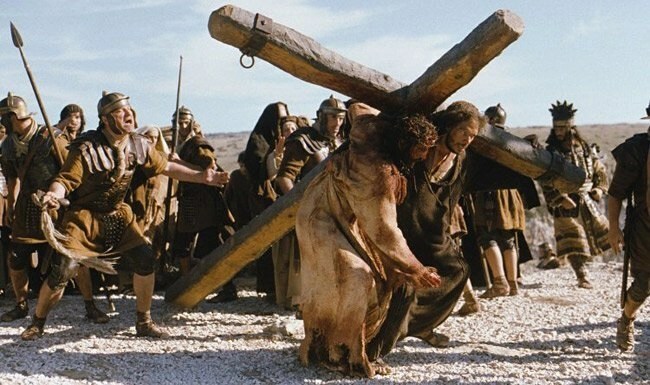 In the movie, Simon’s human nature, like ours, balks at the idea of carrying the cross with Christ. But once he starts, it’s hard to stop. As deadly as sin is, virtue is even more powerful. What about me? Am I still stuck in that moment of indecision, not willing to say Yes or No to the cross? Prayer: Lord Jesus, when I am afflicted by the cross, help me remember that it is you and me, together, arms around each other, carrying the cross up the hill. Amen. Charity can cover up a multitude of sins, St. Peter says. Veronica shows that. Of all the people in the crowd, she stands out because of her charity. 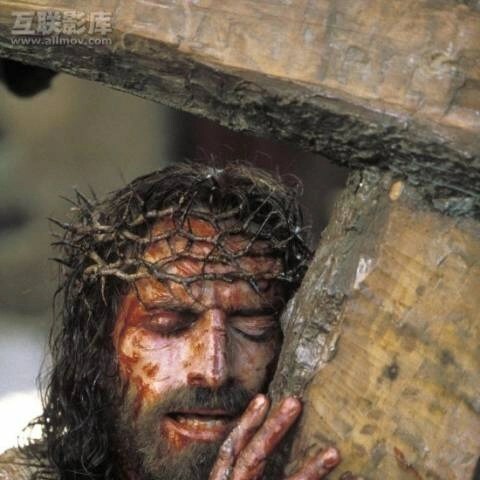 I love Christ, and his suffering pains me. Have I translated that love into action, or am I like those who merely stand on the sidelines and weep? Prayer: Lord Jesus, you rewarded Veronica’s charity by giving her your true image. Help us always remember that we only find happiness by serving the needs of others, not our own. Amen. In the film, Christ isn’t an Achilles or a Superman. He doesn’t carry the cross with physical perfection. He falls over and over again. How often do I make the perfect the enemy of the good in my spiritual life? Do I realize Christ doesn’t expect perfection — but he does expect sacrifice? Prayer: Lord Jesus, I long to finally learn the lesson of your humility. Help me always to struggle to become more holy — even when I fall again and again. Amen. 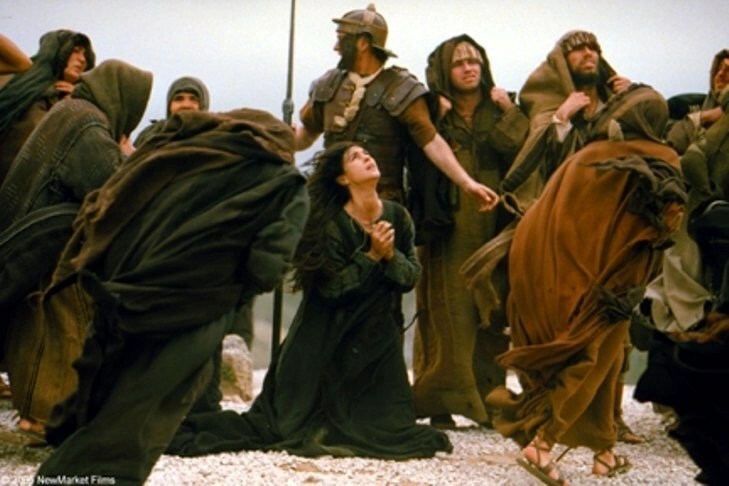 The weeping women are shown only briefly in the film as Christ makes his way through the crowd on the way of the cross. But in a sense, the movie itself puts us, the viewers, in the position these women were in. We watch Christ’s suffering, and we are deeply moved. But have we gone to the next step, as Christ requests? Have we looked more deeply at our own lives? Prayer: Lord Jesus, don’t let us be content with watching you pass by. Give us the grace to take up our cross and follow you. Amen. Prayer: Lord Jesus, the film’s ending reminds us that you vanquished Satan for all eternity. Don’t let me give in to his lies. When I fall, give me the grace to get up again and foil the plans of my enemy by uniting myself with your sacrifice. Amen. 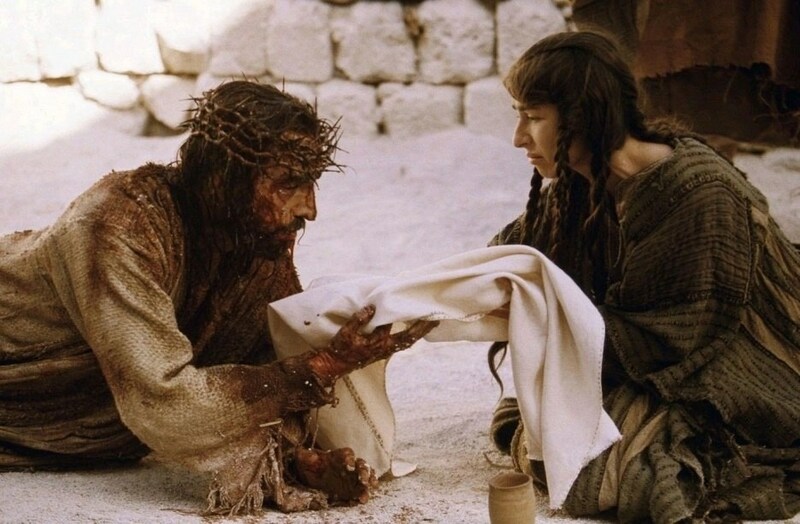 When Christ’s garments are removed, the film flashes back to the uncovering of the bread at the Last Supper. 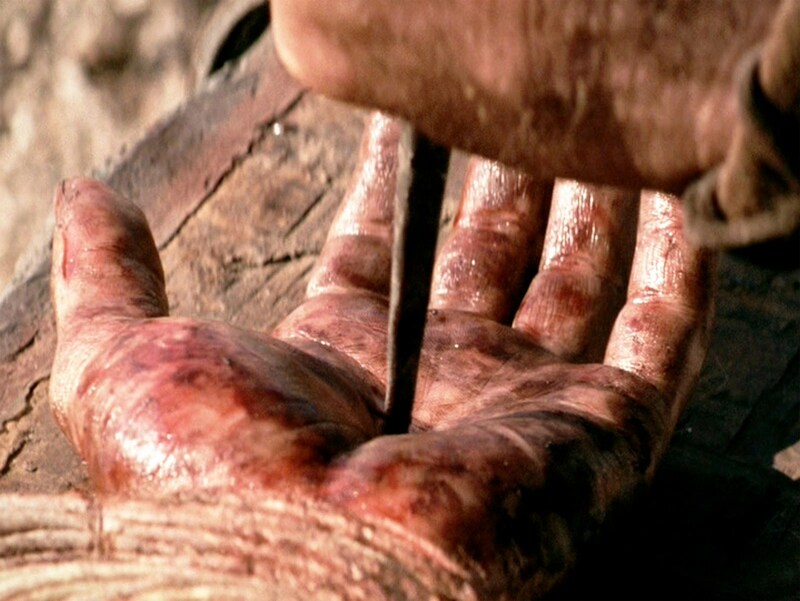 The movie thus reminds us that Christ’s passion is re-presented to us at every Mass. In the Eucharist, Christ is “stripped” of the “garments” of his earthly appearance. But his real presence remains. 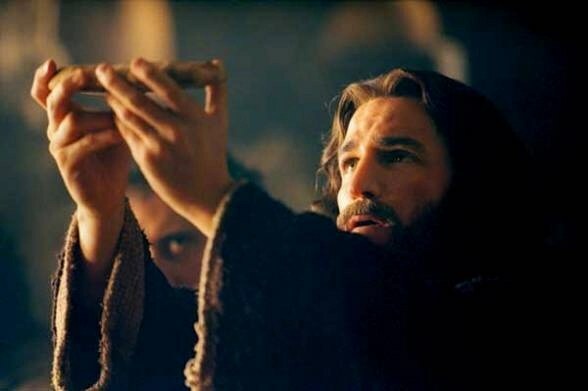 Prayer: Lord Jesus, in your supreme act of humility and love, you give yourself to me totally in the Eucharist. Give me the grace of frequent Communion. Never let me take this precious gift for granted. Amen. Prayer: Lord Jesus, you kept saying, “Forgive them, forgive them,” even as they killed you — or perhaps I should say “we.” Let this forgiveness change my life. Amen. 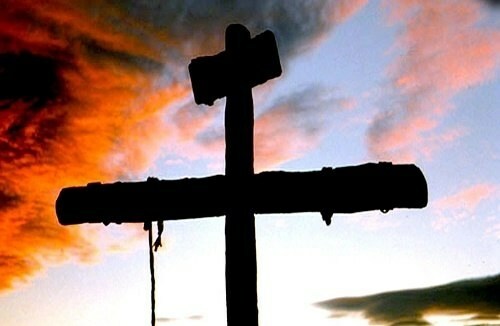 Prayer: Dear Lord, the Crucifixion is the greatest sign of hope in the world. “For I am convinced that neither death, nor life, nor angels, nor principalities, nor present things, nor future things, nor powers, nor height, nor depth, nor any other creature will be able to separate us from the love of God in Christ Jesus our Lord” (Romans 8:38-39). Amen. Prayer: Lord Jesus, we are accustomed to asking Mary to “pray for us sinners, now and at the hour of our death.” May she be as much a mother to us at that hour as she was to you. Amen. Prayer: Lord Jesus, in the trials of our lives, we are strengthened — and kept alert — by the knowledge that you will return one day. Help us to watch and pray as we await you. Amen. Let us pray the Apostles’ Creed for the intentions of the Holy Father. Prayer: Lord Jesus, our Way of the Cross devotion is done. But now we begin another way of the cross, as we take up our cross to follow you each day. Help us carry our crosses with joy, knowing that you share our burdens with us. Amen.